Shoes of Prey is an e-commerce startup based in Sydney that lets customers custom-design their own shoes. Since the online business first opened, however, it has faced a major problem – customers are not able to hold the shoes in their hands prior to purchase and delivery. "There will always be that want of a physical experience,” said Shoes of Prey chief creative officer, Jodie Fox. It’s a problem that all online retailers face – customers want to touch, feel or smell the product before they buy, she said. This may be even more important to Shoes of Prey customers since they are designing the shoes themselves and may need extra assurance that they have created a good design. Shoes of Prey plans to close that gap between customer and product using a combination of motion-based controls and 3D holograms. The effect is like a mix of the hologram of Princess Leia in the original Star Wars movie and the floating, gesture-based displays of Minority Report. “The purpose is to remove the technology between you and the design experience,” Fox said. Fox and Shoes of Prey engineer, Ritwik Roy, demonstrated the technique for CMO Australia. The demo used a rudimentary prism made of Tupperware plastic to display a 3D image of the shoe. 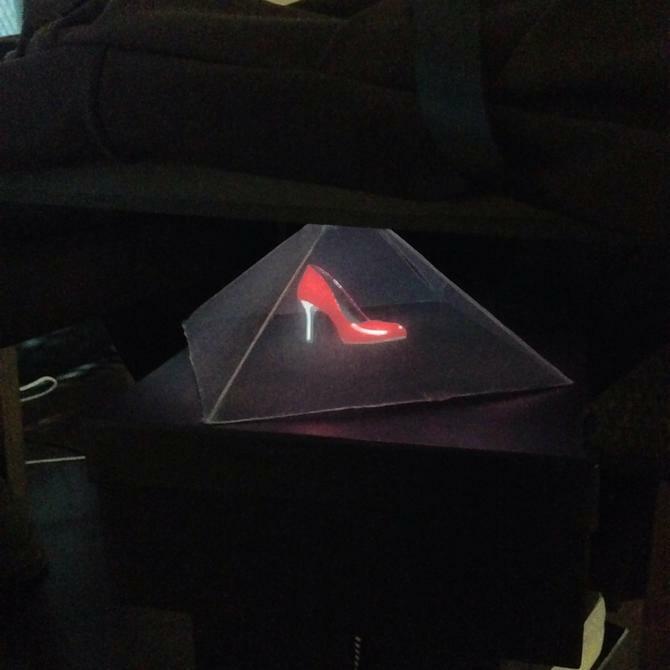 A monitor above the prism projected four images into each side of the prism, making it appear that there was a 3D shoe inside. In the demo, the shoe could only be moved on a horizontal axis, but Shoes of Prey continues to develop the interface, “taking inspiration from Tony Stark in the Iron Man movies,” according to Roy. It is possible to customise the shoe on the fly using a nearby iPad. Customers can tap different colour and material icons and see the change reflected immediately. However, Roy is not completely satisfied with this method and it may change in the future. “It’s a problem we’re still trying to figure out,” he admitted. Using gestures to select options – for example with a swipe of the air to choose the next option – may be too clunky and slow down the user, said Roy. Using voice is another possibility, but recognition technology may not yet be good enough for this to be realistic, particularly in a noisy store or mall environment, he said. While Shoes of Prey won’t give a firm timeframe for rolling out the technology to the public, Fox said it may appear first in the form of a kiosk in physical retail stores. Shoes of Prey has a mini-store located inside David Jones in the Sydney CBD and is considering more locations in the future. "If we were to prioritise this as a project, I think we could get it up quite quickly,” she said. Bringing the technology into homes is a longer-term goal. Leap Motion itself is a relatively cheap accessory and some computer makers have included the technology in new laptops. However, the main hurdle is getting 3D displays into residences. "It would be amazing to have this in people’s homes, but I think that is still a long way off,” Fox said. Still, the technology does work with 2D screens and Roy said Shoes of Prey could add Leap Motion support for its website. That would allow for gesture-based manipulation directly in the browser on any device that supports Leap Motion and WebGL.